State Trustees has relocated its head office from Exhibition Street in Melbourne to Footscray. 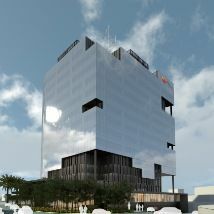 The new purpose-built head office at 1 McNab Avenue brings State Trustees closer to Melbourne’s western growth corridor. The move also completes State Trustees’ regionalisation strategy with Bendigo and Dandenong offices and regional outreach services. The new state-of-the-art building reflected the broader transformation of the organisation into a modern, service-focused and world-leading trustee organisation. State Trustees has put a lot of effort into changing the way we connect with people who use our services. It is exciting to be moving to a new facility that can help us deliver on this commitment and meet the changing needs of more Victorians as well as providing a fresh and modern work place for employees to foster innovation and collaboration to benefit our clients. We would like to thank those in Footscray and the surrounding area that have already reached out to us and made us feel so welcome. We are very much looking forward to becoming part of the vibrant Footscray community and to continue to reinvigorate and improve our service delivery for all Victorians. State Trustees is one of a number of tenants in the building and will provide a full range of financial administration, estate administration, Will preparation, Enduring Power of Attorney preparation and Trustee services.